Hiya guys! There is all sorts of excitement for this post on multiple levels. Not only are these gorgeous, but it's a duo from my two favorite makers! 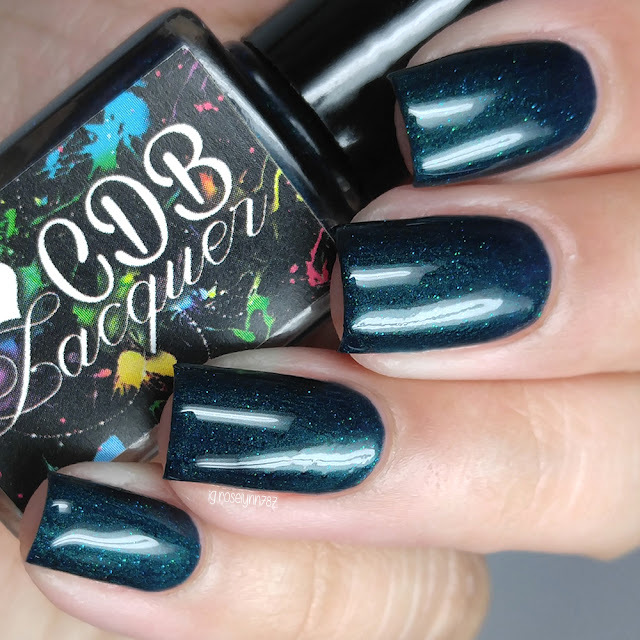 Today I'm sharing the Deadly Dames Duo by Supernatural Lacquer and CDB Lacquer. As you may know CDB Lacquer closed shop a few months ago, so this marks her very last polish ever! 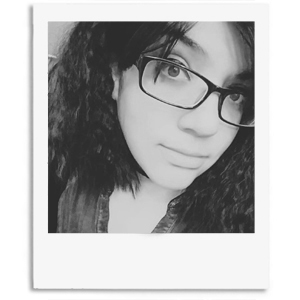 It's very bittersweet for me as a blogger and as a personal friend of Cheyenne. She was one of the first indies to ever give me a try and also the first friend I ever made in our community. I'm so thankful and excited to be showcasing these for you guys, so let's stop babbling and get to it! The Deadly Dames Duo by Supernatural Lacquer and CDB Lacquer will be releasing tonight, Friday October 7th at 9PM EST. These will only be sold as a full-sized duo set retailing at $16.00 and there will only be 30 available. Once it's sold out, they will both be gone for good! 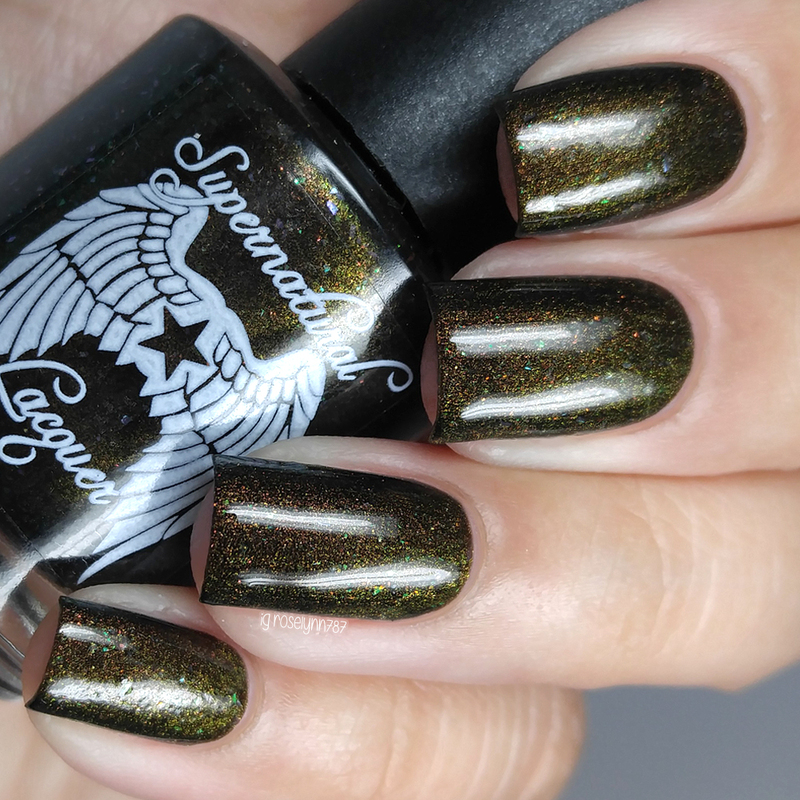 Siren can be described as a blackened teal base filled with metallic teal micro-glitter. The micro-glitters here work so well with the darkened base to give this polish so much dimension. Absolutely gorgeous! The formula has a really smooth application and an opaque consistency. It dries to a slightly gritty finish, but smooths out perfectly with one layer of topcoat. And even though it's highly pigmented, I didn't experience any staining when worn for a few days. Shown in two coats and sealed with a glossy topcoat. Medusa can be described black base with green to copper duochrome shift and green illusion flakes. I feel like my photos really don't do this shade any justice, there is just so much more chrome shift! The formula had a really nice smooth application on par with what I accustomed to from Supernatural Lacquer. Great coverage overall. Shown in two coats and sealed with a glossy topcoat. Overall I have to say I simply love, love, love this duo! It was a long-time dream of mine to see my two favorite ladies come together like this and now it's finally happened! And as I mentioned before, of course it's very bittersweet knowing this is the final CDB Lacquer ever.... but dang Cheyenne is going out with a hella bam! Definitely a must-have duo for any collection, but especially for those who enjoy a lot of vamp in their polish. 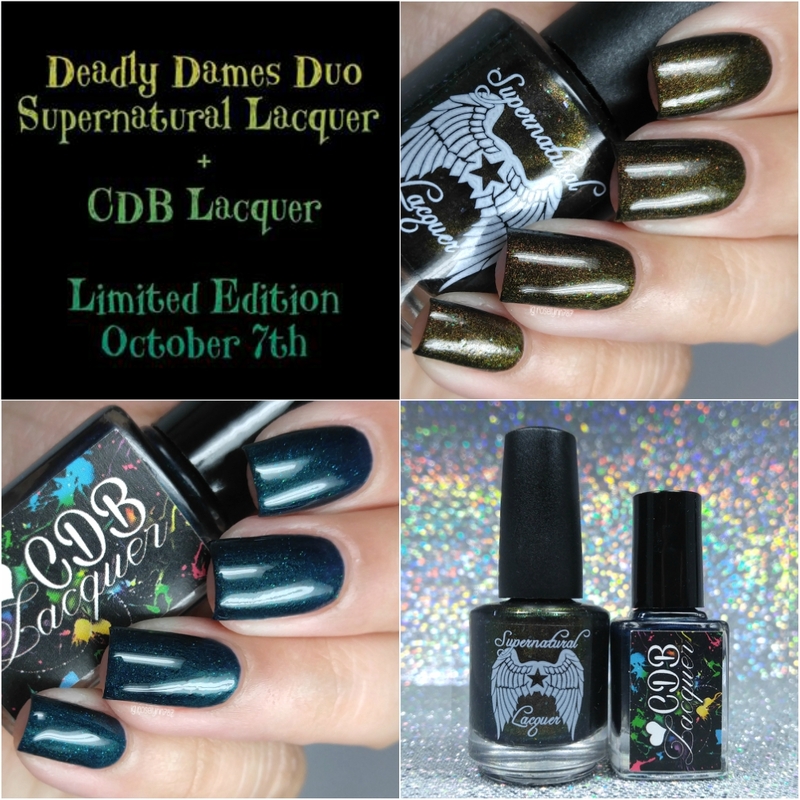 To recap, the Deadly Dames Duo by Supernatural Lacquer and CDB Lacquer will be releasing tonight, Friday October 7th at 9PM EST. These will only be sold as a full-sized duo set and there will only be 30 available. Once it's sold out, they will both be gone for good!